Samsung is crushing it at the moment, but keeping up that momentum could be tough. The South Korean tech company shrugged off a series of setbacks in the past year and a half -- including fire-prone phones and jailed executives -- to post record earnings and become the world's biggest chipmaker. Samsung (SSNLF) is the world's largest maker of smartphones, but it also makes chips and other parts for all kinds of electronic devices. On Wednesday, it reported operating profit of about 54 trillion won ($50 billion) for 2017, a new annual record. Samsung's revenue just from its computer chips business climbed to around 74 trillion won ($70 billion), beating rival Intel's (INTC) total revenue of $63 billion. 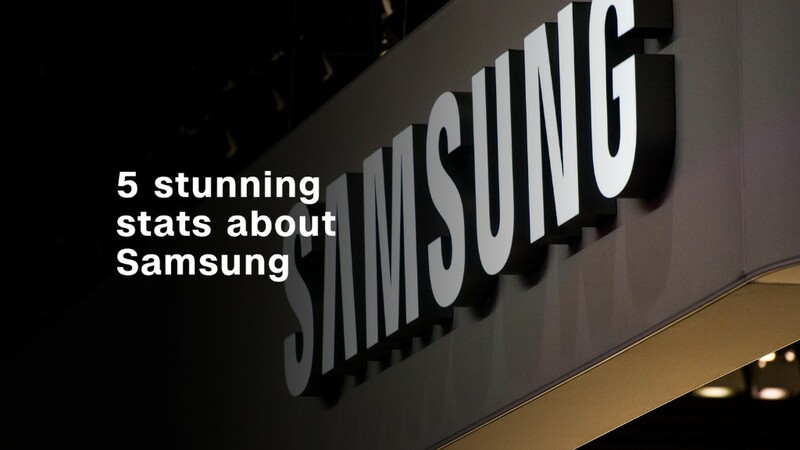 But analysts say Samsung, South Korea's biggest company, could face bumpy times ahead. The end of the chip boom? Samsung's surging sales have benefited hugely from strong demand for memory chips, which are used in everything from smartphones to medical equipment. But some analysts say the market may be peaking. Morgan Stanley alarmed investors with a report late last year suggesting the so-called "super cycle" in memory chips could soon be over. Big chipmakers are playing down those fears. Samsung said Wednesday that it expects stable supply-and-demand conditions for memory chips in 2018. Samsung's fortunes are in part tied to those of rival smartphone maker Apple (AAPL). The U.S. company buys components like chips and screens from Samsung to use in iPhones and iPads. Samsung supplied flexible screens for the iPhone X, but Apple is reportedly cutting production of the pricey smartphone because of lackluster sales. To meet demand from Apple last year, Samsung invested heavily in flexible screen production. That means a drop in demand will have a "key negative impact on earnings in 2018," according to SK Kim, an analyst at investment bank Daiwa. Another potential concern for Samsung's bottom line is South Korea's currency. A stronger won drives up the price of Samsung's key products, making them less competitive on global markets. "Samsung is exposed to foreign exchange risk arising from various currency rate fluctuations," analysts at Susquehanna International Group wrote in a research note published ahead of Samsung's earnings. Samsung said Wednesday that a stronger won put a dent of about 650 billion won ($620 million) in its profit in the fourth quarter of 2017. U.S. trade policies could also add to Samsung's headaches. Protectionist measures like those being touted by President Trump could lead to a weaker U.S. dollar and therefore a stronger won, according to Kim. Trump already slapped heavy tariffs on U.S. imports of washing machines, which directly affects Samsung. The company called the move "a great loss for American consumers and workers." Samsung's leadership has been battered by uncertainty. The company's de facto leader, Lee Jae-yong, is currently in prison, serving a 5-year sentence for bribery and other corruption charges. Lee is appealing the court's decision. Several other senior Samsung officials were also convicted. And one of the company's most prominent executives -- the man who's been running the booming memory chip business -- is scheduled to step down in March. That's part of a broader overhaul of Samsung's top management, adding to the uncertainty about what comes next.